The stock rallied 8 per cent to Rs 1,418 after the company announced that they have signed a $ 125 million (Rs 900 crore) supply contract with a leading global chemical conglomerate. Shares of Aarti Industries have rallied 8 per cent to Rs 1,418 apiece on the BSE in intra-day trade after the company announced that they have signed a $125 million (Rs 900 crore) supply contract with a leading global chemical conglomerate. The contract entails the supply of a high-value specialty chemical intermediate for a period of 10 years. The plant is expected to commission in Q4 FY2021, with average annual revenue of $ 12.5 million. “The company estimates a capital investment of approx $ 15 million (Rs 106 crore at exchange rate of Rs 70.95) to setup a commercial scale manufacturing facility for the production of this speciality chemical intermediate in the state of Gujarat. 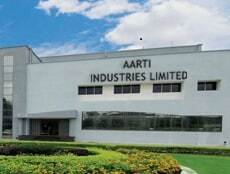 The product is not part of company’s existing product range,” Aarti Industries said in a press release. The stock of Aarti Industries had underperformed the market by falling 23 per cent from its recent high of Rs 1,707 on February 4, 2019. In comparison, the benchmark S&P BSE Sensex was down 2.3 per cent during the same period till Wednesday. The stock hit an all-time high of Rs 1,792 on February 5 in intra-day trade. In the past five years, the market price of Aarti Industries appreciated by 15.5 times or 1448 per cent from the level of Rs 91, against 73 per cent rise in the benchmark index.